In the far north of Europe. 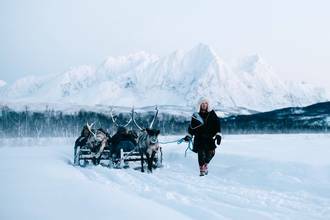 In this cinematic, aerial film Babang Deshommes shows us the indigenous people of Northern Europe and Russia, the Saami. Living in what is currently northern Sweden, Norway, Finland and the Kola Peninsula in Russia, the Saami live the lifestyle of their ancestors - hunting, fishing, and trading. Babang Deshommes does an excellent job showcasing their lifestyle and beautiful yet frigid home in this piece. Description: The Sami people live in four countries: Norway, Sweden, Finland and Russia. The total population in these four countries is estimated at approx. 80,000, of whom around half live in Norway. Slightly under half of these people talk Sami. I Norway, the Sami people live in almost all parts of Northern Norway, and in Trøndelag and in Femundsmarka in Hedmark. Thanks to @skaldvikings for the Music.